Paul David and his 1993 rick. 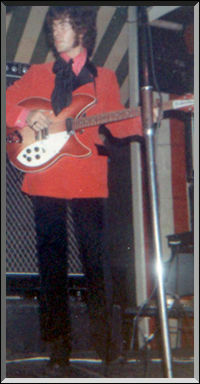 A story about a Rickenbacker Model 1993 by Paul Davies. beaten up 1993s (The first British Rickenbacker 12 strings) in a shop in Shaftsbury Avenue, London, I think it was called "Top Gear" The dealer told me that they had both belonged to Pete Townsend and had been broken and repaired. I picked the better of the two and paid £100. The neck had been broken and repaired but it stayed unbelievably in tune, in those days having been owned by Pete Townsend didn't mean a great deal. I kept it for around three years and during that time my band Octopus used to support YES at The Marquee club in London before they made it really big...."
Left: Me and my rick on stage at The Marquee London. 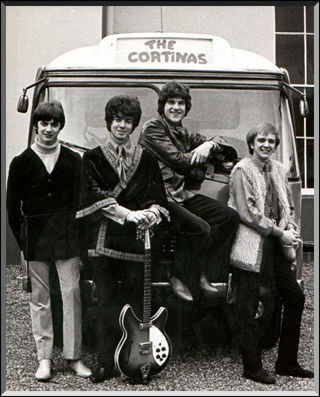 Right: Shortly before we changed our name from The Cortinas to Octopus 1968. The Hippy tops that my brother and I are wearing were from the Beatles Apple Boutique. I actually took the guitar to Steve at Advision Studios and they let me stay for the evening. They were doing overdubs to "Yours is no Disgrace" and had two guys from a band called Gnidrilog (probably wrong spelling) putting recorders on "Your Move". Their roadie Mike brought the guitar back a few days later complete with a new set of strings. He borrowed it again but I can't remember when or for which track. This guitar is not used on any of the tracks on The YES Album. My biggest regret is selling that guitar...."
Left: Me with my 1993 aprox 1968. 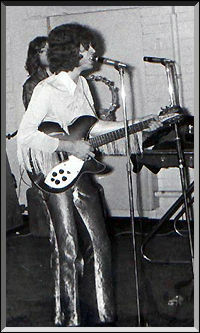 Note the high fashion crushed velvet trousers. A few words from Björn: "... - If anyone knows where to find this guitar today, please let me know!! I'm also extremely interested in photos from "The YES Album" recording session! Thank you!....."